As Florida Governor Rick Scott campaigns in Connecticut to tell Connecticut businesses why they should consider moving to his state, the Connecticut State Police Union says he should go home because his priority should be the weekend on-duty death of a Florida State Trooper. Scott is in Norwalk today where the Connecticut State Police Union says he’s bragging about how Florida has cut $6.7 billion in taxes and created over 1.5 million jobs over the past six years yet the Florida Highway Patrol has the lowest paid troopers in the country with a starting salary of $33,977. 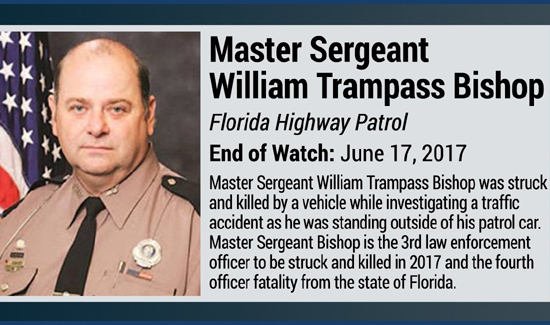 Master Sergeant William Bishop, a 30-year veteran of the Florida Highway Patrol, was conducting a motor vehicle accident investigation Saturday morning when he was hit and killed by a passing motorist. According to the Connecticut State Police Union Bishop was only making $61,192.48 after 30 years of service. The union says troopers who make the ultimate sacrifice protecting others should be fairly compensated so their families can survive after their passing. The union says the Governor should be with Bishop’s family mourning his loss and ensure he has a proper and respectful burial. The union goes on to say it’s the least he can do for Master Sergeant Bishop who gave his life protecting the State of Florida. Connecticut Troopers will travel to Florida to show their support for the Williams family and say members our thinking of and praying for the family and other members of the Florida Highway Patrol.